In this final lecture in the “Global Environmental Politics in the 21st Century” series, Dr Benjamin Habib explores possibilities for a regenerative environmental politics based on the archetype of the “intellectual shaman,” as defined by US academic Sandra Waddock. In traditional societies, shamans functioned as healers, connectors and sense-makers. Waddock argues that academics and intellectuals can take on this archetype, moving across and beyond traditional intellectual boundaries to perform the healing, connecting and sense-making roles in the present moment. As we enter the Anthropocene, we are at a pivotal juncture in the human journey; what we do right now matters in helping to shape what the human future is going to be. A constructive political actor in the Anthropocene has to do more than protest and say “no” to things. We also need to say “yes” to things, articulate a vision and construct working models of sustainable, regenerative systems. The intellectual shaman archetype provides a framing for this project. The lecture begins by introducing the concept of the Intellectual Shaman as an archetype for a regenerative environmental political actor. It then reflects on seven key themes have overlain our exploration of global environmental politics this semester in POL2GEP. It share’s four tools for action from the conceptual tool kit of the Intellectual Shaman, then challenges the audience to use these tools in becoming constructive players in international environmental politics. This lecture was delivered on Thursday 20th October 2016 at La Trobe University as part of the second year undergraduate subject Global Environmental Politics in the 21st Century. 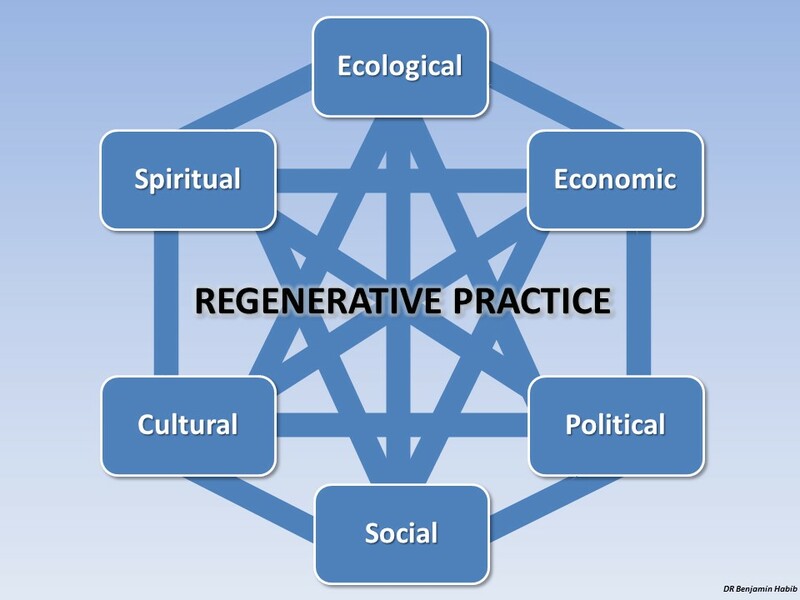 Elements of regenerative practice. Ideally a holistic regenerative politics should be mutually-reinforcing across all of these elements.